Argo is an international programme dedicated to collecting high quality data across the global ocean using free-drifting robotic floats. There are over 3500 of these free-drifting profiling floats in the global array, all measuring temperature and salinity in the upper 2000 metres of the ocean. The UK has been an active member and strong supporter of the Argo project since it began in 2000. Since then, the UK has deployed over 300 floats in the Indian, Atlantic and Southern Oceans and is fully committed to helping to maintain the global array of floats. The Argo array has quickly become a crucial element of UK operational oceanography and plays an important role in the ocean analysis and forecasting activities of the National Centre for Ocean Forecasting as well as contributing to exciting developments in climate science. 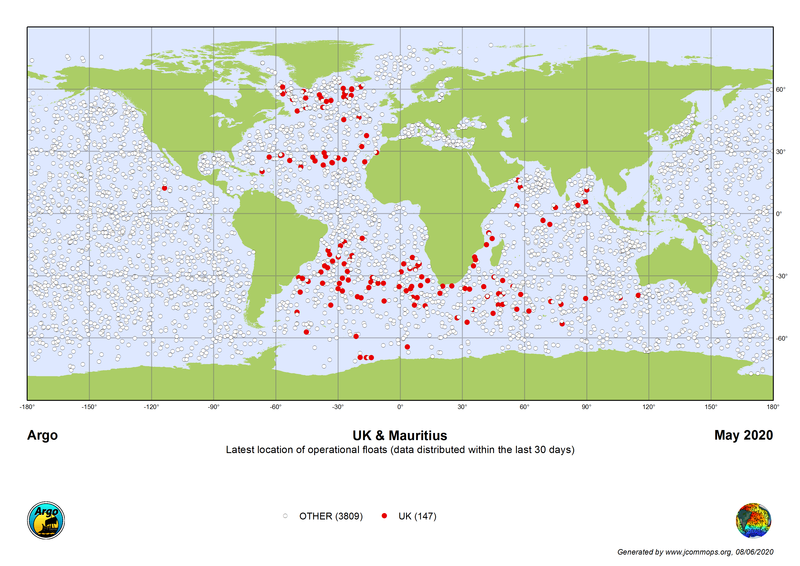 UKArgo.net is hosted by the British Oceanographic Data Centre (BODC) with contributions from the National Oceanography Centre (NOC), the Met Office and Plymouth Marine Laboratory (PML). © 2019. Last updated : November 14, 2017.